Critics of the Conservative government have long argued that the Harper government has launched a full-scale attack against Canada's Employment Insurance program. There's new evidence that buoys this argument. This week, Press Progress, the communications arm of the left-leaning Broadbent Institute, published a blog post which suggests that, in June, only 36.6 per cent of unemployed workers in Canada received EI benefits. They claim that is an all-time low. "The new milestone, calculated by comparing the number of regular EI beneficiaries in the latest Statistics Canada report with the number of unemployed workers from the Labour Force Survey, follows a series of policy changes over the last two decades that have made access to benefits increasingly difficult. "In 1990, 83% of the unemployed received benefits, but it took a dive to 42% in 1998 — when the former Liberal government redesigned the program to make it far less generous. After further changes by the Harper government in recent years, the beneficiaries-to-unemployed ratio fell below 40% in 2012 for the first time in almost 40 years." The calculations were done by Angella MacEwen, an economist with the Canadian Labour Congress. The Harper government has indeed introduced new, more stringent rules around collecting EI benefits in response to allegations of widespread misuse and fraud. Under the new rules, which came into effect in January 2013, a job seeker could be obliged to take a job outside his or her industry and community and take a pay cut of as much as 30 per cent. Regardless, the Tories say that the Broadbent Institute's claims are fallacious. 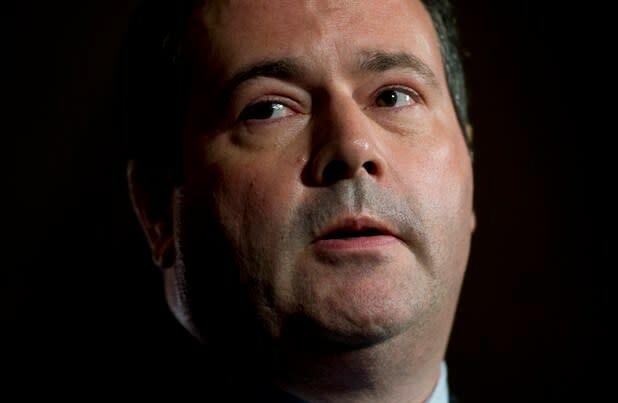 "Our Government has made modest and reasonable changes to EI to better connect unemployed Canadians with available jobs in their local area that match their skills," Nick Koolsbergen, a spokesperson for Minister of Employment and Social Development Jason Kenney, told Yahoo Canada News. "The Opposition is purposely misleading Canadians about the facts in a fear-mongering attempt to score cheap political points. In fact, the data clearly shows that far less than 1% of EI claimants were disqualified because of our changes. The rules around applying for and qualifying for EI have not changed." The Tory's position — that they're not attacking those on EI — is weakened, however, when their MPs put their respective feet in their mouths. According to the NDP, it happened again this past weekend. The New Democrats are drawing attention to an off-the-cuff comment by Infrastructure Minister Denis Lebel which they say further denigrates and vilifies Canada's unemployed. Here's an excerpt from their statement posted to the NDP website on Monday. This isn't the first time that the Tories have gotten into hot water for comments about employment insurance and employment recipients. In their statement, the NDP graciously remind us that Minister Diane Finley once referred to the unemployed as the "bad guys" and that MP Gerald Keddy inferred that Nova Scotians, disinterested in farm labour jobs,were "no-good bastards sitting on the sidewalk in Halifax." Lebel's office didn't immediately reply to Yahoo Canada News' request for an explanation about his weekend comment.